Nice. I like this a lot. Composition is great, and the lighting on the plug end makes it stand out so well. Great detail and texture on the top of whatever that is! really tactile. Like the curves and patterns too. It's a power cable, yes? Took me a while to work it out. Good shooting. This is kind of unnerving, which means you did a great job of protraying the title. 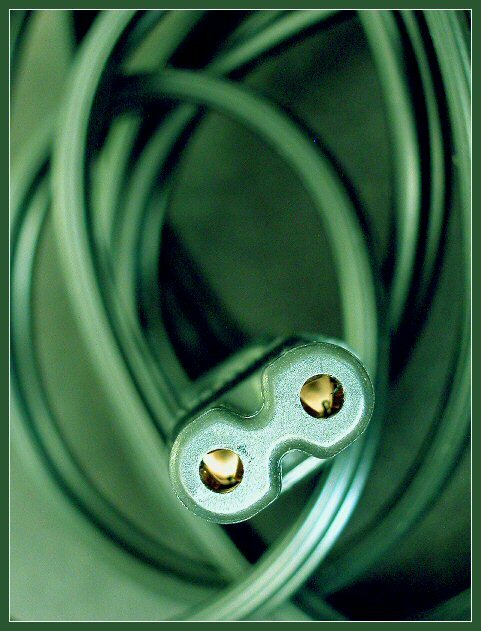 The position of the 'plug' is great, and I like the dof/tone of the rest of the image. There appears to be some graininess with the background, not sure if it is intentional or not, but either way I like it. The only other thing is my disappointment in not being able to get the entire image on my screen at one time, but that's my fault for having a small screen size! Well pulled off, very effective - 9. Nice one... really gives a "creepy" feel because the wire almost does look alive and looking at you. Way cool shot. Like this. Proudly hosted by Sargasso Networks. Current Server Time: 04/26/2019 02:43:27 AM EDT.